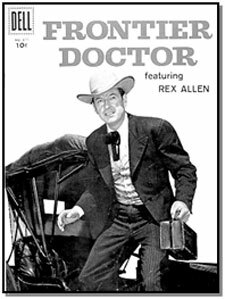 Rex Allen’s “Frontier Doctor” depicted the adventures of physician Bill Baxter (circa 1890’s) in the town of Rising Springs, AZ. In those times the role of medical doctor went beyond dispensing medical advice, birthing babies and treating gunshot wounds. The town doctor was looked upon as the moral backbone of the community. Dr. Baxter never carried a gun (or sang as Rex had done in films) but didn’t hesitate to pick up and use, when necessary, someone else’s pistol in an effort to uphold justice, protect his patients and prevent further bloodshed. 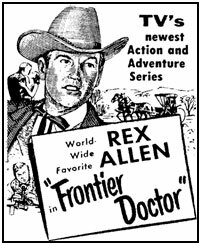 “Frontier Doctor” was the 4th series to begin lensing from Republic’s Hollywood Television Service. The inspiration came from Rex, himself, while looking for ideas at the library, stumbling across a turn of the century book on frontier doctors. He then interested his former film producer, Eddy White, in the series. Starting March 26, 1956, director Franklin Adreon helmed the first two episodes. Action ace William Witney took over the series in December ‘56 for the final 37 half-hour episodes. Beginning syndication in ‘57, the series was Hollywood Television Services’ second biggest moneymaking syndicated TV series (behind the Emmy Award winning “Stories of the Century”). Dell Comics issued FRONTIER DOCTOR as Four Color #877 in February of ‘58, adapting two of the TV episodes to comic form, “Storm Over King City” and “Apache Uprising”, with artwork by Alex Toth (right). There was a photo cover and inside front cover photos from the TV series. No further issues were published. In Fine, the single FRONTIER DOCTOR issue is around $30.